On a night when Frank Lampard was gifted a wonderful start to football management, Reading's Paul Clement suffered the disappointment of a last-minute defeat to Derby County. Beginning his first full season with the club, Clement, who has previously managed Derby County, came in for criticism from one of his and the club's former players, Darren Bent. It was inevitable [Clement] was going to crumble [at Derby]. Training had changed and his philosophy from pre-season had gone out the window because we weren’t getting the right results. And ultimately he didn’t really like confrontation. After last night's disappointing defeat, the man who once closely worked with Carlo Ancelotti at Chelsea, Real Madrid, Paris St. Germain and Bayern Munich, came out swinging. Signed on a free transfer a month after Clement joined the club in June 2015, Bent managed 25 appearances in the 2015/16 season; although, given that Clement was sacked in February 2016, it is understandable that some lingering regrets remain. 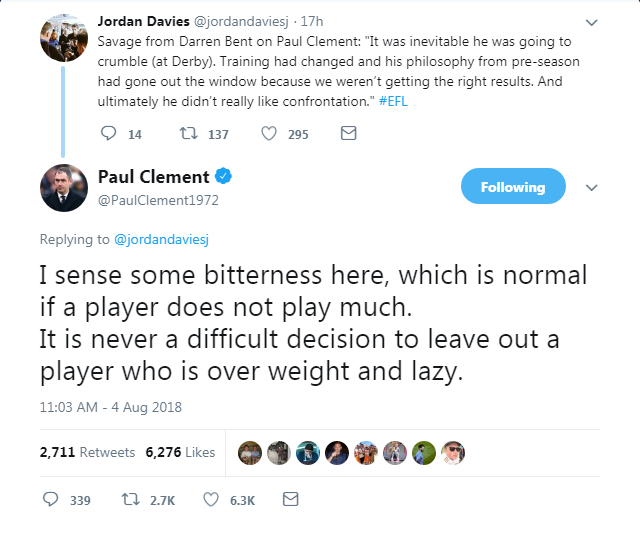 Criticising Bent for being both "overweight and lazy," it may not perhaps be the best course of action for a football manager to engage in such trivial rows online.